Not looking for Mecalux Pallet Racking – Click here to return to our Identifier or Contact Us! Mecalux is a global provider of warehouse racking systems, having expanded from Spain in the 1960s to support businesses in over 70 countries. This wide experience base has enabled Mecalux to make its racking effective across various industries and adaptable to all types of businesses. Here at Advanced Handling, we have used Mecalux pallet racking to design ultra-efficient storage solutions to support manufacturing, construction, food and drink, retail and a variety of other industries. Conventional pallet racking is a universal solution for larger workplaces with wide aisle access. Advanced Handling & Storage Ltd are able to configure layouts for your business which can give you the efficiency you need. 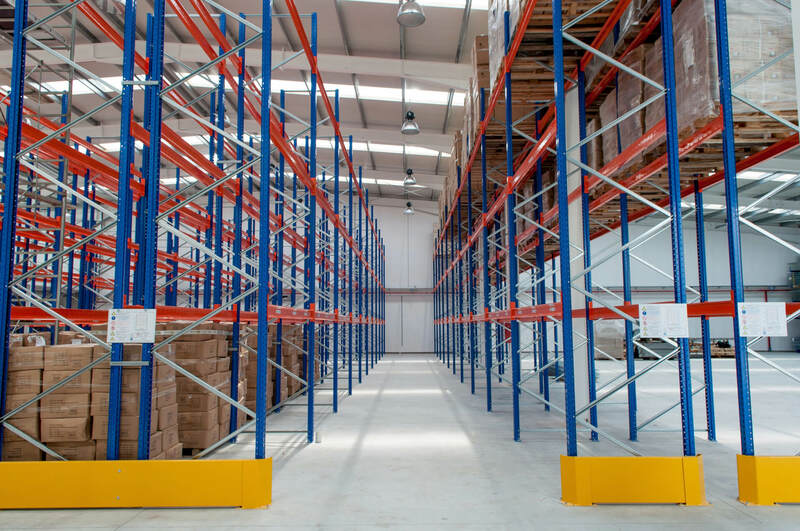 If you require quick access to every pallet, then conventional pallet racking is an ideal solution for you. This is the most versatile option and most common which you would see in a warehouse due to its flexibility and effectiveness. Mecalux’s drive-in racking is perfect for large quantities of the same non-perishable stock because you can eliminate operating aisles. Instead, a forklift is used to position pallets in a system that is often used in cold storage as it makes maximum use of space and therefore minimises costs in a temperature-controlled environment. This sort of system allows total control over storage and retrieval options and maximises profitability of available space. Mecalux Push-back pallet racking offers deeper pallet storage on each bay with last-in-first-out accessibility. After removing the front pallet, the ones behind will then automatically move to the front. The versatility of new Mecalux pallet racking available from Advanced Handling and Storage Ltd allows our experts to tailor and configure layouts of pallet racking to suit your exact requirements. We can deliver directly to any UK location. We also offer a nationwide installation service by our SEIRS approved pallet racking installers.